Halve and deseed delicate squash. Bake at 350 until tender. Soak white beans overnight. Cook beans and drain. Add spinach, green onions and pistacio’s to hot beans. Mix with apple juice and spices. 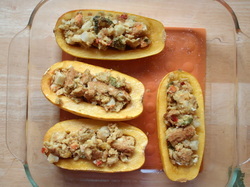 Stuff cooked squash and serve.